SYDNEY, Australia -- The Gilgamesh Cultural Centre celebrated the 150th anniversary of the University of Sydney. Many Assyrian dignitaries and government officials attended the function. The celebration also included the official ceremony of the unveiling of the Statue of Gilgamesh. The statue was unveiled by the Chancellor of the University of Sydney Emeritus Professor, Dame Leonie Kramer. 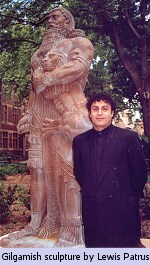 The Statue of Gilgamesh, built by the renowned artist, Mr. Lewis Patros, was presented by the Gilgamesh Cultural Centre to the University of Sydney on its 150th Anniversary. This event took place on Sunday, October 15th, 2000.